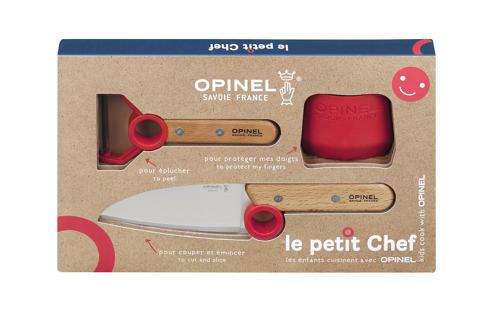 TRIO BOX SET - With the Le Petit Chef collection, Opinel has invented a new way of cooking with children. This box set contains a kitchen knife, peeler and a finger guard. The educational ring helps position the fingers correctly and prevent the hand from slipping onto the blade and helps position the hands on the peeler. The finger guards protect the hand holding the food while it is being cut.